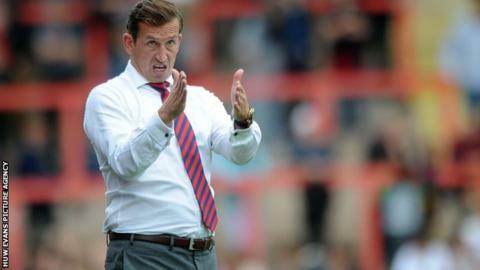 Newport County manager Justin Edinburgh has signed a two-and-a-half year contract extension to commit himself to the club until 2016. Edinburgh, 43, succeeded Anthony Hudson as manager in October 2011. The former Tottenham full-back led County to the FA Trophy final at Wembley and got them promoted back to the Football League after a 25 year absence last season. "It was an easy decision, yet again, to extend my contract," said Edinburgh.
" Hopefully, we will continue the progress we have made, on and off the field. "We had a really tricky start here, when we were 3-0 down at half-time, but since then it has really progressed. "We have had two trips to Wembley, a promotion and a fantastic start to this league campaign. "Off the pitch there is a lot happening, with appointments and people coming here which gives it a stronger foundations." Edinburgh's previous deal ran out at the end of this season. He celebrated his two-year anniversary with the Rodney Parade outfit in October. Newport, who are just outside the play-off places in League Two, have kept a manager whose stock has risen during his two years in South Wales. Edinburgh has been linked with jobs away from Rodney Parade. "I have had approaches and I have always been open and honest with the club about that ," said Edinburgh. "I have made people aware, but I have done a long apprenticeship in the lower leagues and I am fully aware of the support I have here. "None of those interested parties turned my head....I think I can continue to progress here. "You can never say you will never move on and if I did people would know I was lying. "But for the next couple of years I see my work and future with Newport AFC."